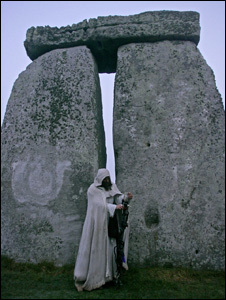 A seven-tonne steel statue, erected at Stonehenge each year to mark the summer solstice, is to be rented out. The 22ft (6.70m) figure, known as the Ancestor, cost more than £35,000 and took nine months to build. But its creators, Andy Rawlings and Michelle Topps, have been unable to sell it and now want to rent the statue out for festivals and events. The monumental statue with “head thrown back and arms open wide” made its debut at the summer solstice celebrations at Stonehenge in 2010. And until recently, the “Big Man” had a prominent position outside the Holiday Inn on the A303 at Solstice Park in Amesbury. Now it is back at the couple’s workshop undergoing refurbishment and “some anti-rust treatment”. “He’s actually cost us closer to £40,000 – he’s had a new arm and we were paying for the insurance on having him outside the Holiday Inn,” said Mr Rawlings. 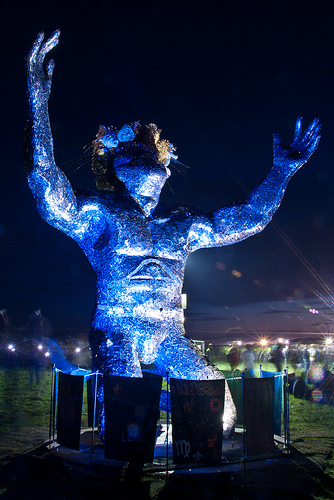 Created out of thousands of hand-cut pieces of steel welded to a steel frame, the statue can – according to Mr Rawlings – be “easily” dismantled and loaded on to a 7.5 tonne lorry. “People don’t realise how easy he is to assemble and just how moveable he is,” said Mr Rawlings. “With a crane-assisted lorry, two people can do it in a couple of hours. “And we really like the idea of renting him out – either for a day or long-term – and taking him to festivals or places like Landsend, Blackpool or even football clubs. Refurbishment is expected to be completed within the next couple of months, after which the Ancestor will be available to hire.